Leading Manufacturer of shoe eyelet for shoes industry from Mumbai. With assistance from highly qualified and experienced professionals, we are engaged in offering a huge gamut of Shoe Eyelet for Shoes Industry. 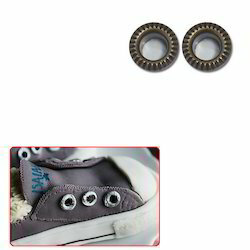 These eyelets are manufactured using high grade basic material and latest technology at our end. Further, these eyelets are severely checked under the supervision of our well trained quality controllers on several quality parameters set by the industry. In order to fulfill variegated demands of clients, this eyelet is made available in customized options.